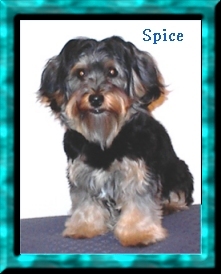 Sugar was born February 1, 2000 and Spice on February 3rd, in Bishopville, SC. We adopted them on March 17, 2000. Shortly after bringing them home I made the mistake of teaching them HTML and 'Tails from the Crate' was born. 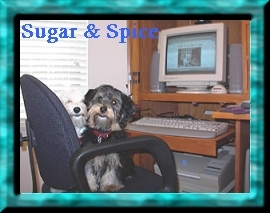 Sugar and her dog Spice are the senior editors of 'Tails', hostesses of the Wee Poos WebRing, and recently started a "Poo" and Mutt-related message board. 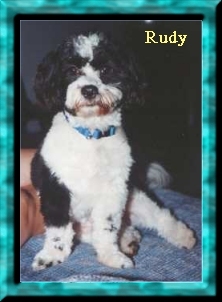 Rudy was born on Oct. 17/98 and he came to live with his human parents on July 31st/99. He had 2 other families along the way, but they didn't appreciate him for the great dog he is. 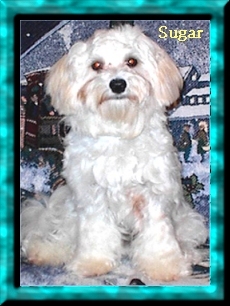 He is a Shih Poo, and takes the best characteristics of both breeds. He loves to cuddle and always has a hug when you are feeling down. You couldn't ask for a better friend.